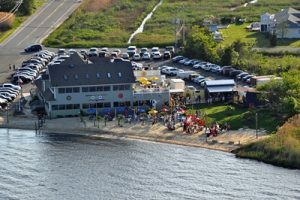 Central New Jersey’s fastest growing restaurant company, MJ’s, has just purchased their sixth restaurant location on the Barnegat Bay in Berkeley Township, Ocean County, New Jersey. This is the first MJ’s location in Ocean County and the first waterfront location for the company. The broker for the sale was Richard R. Santore of, Bielat Santore & Company, Allenhurst, New Jersey. Bielat Santore & Company is MJ’s exclusive real estate broker that has selected the sites, negotiated the transactions and secured financing for each of its six locations. MJ’s purchased a restaurant and bar formerly known as the Cove, with 300 feet of frontage on the Barnegat Bay in Berkeley Township, New Jersey. The 3+ acre property includes a 13,000 square foot fully equipped restaurant and bar, an outdoor deck, tiki-bar and kitchen. There are also 21 boat slips at the site. The restaurant will undergo extensive renovations in order to convert it into an MJ’s restaurant. These renovations are expected to take 60-90 days to complete. MJ’s anticipates opening up for business on or before Memorial Day weekend. MJ’s restaurants specialize in standard American fare, with an attention to taste and quality in a fun-filled, sports-bar style environment. Each location has its own unique charm and relaxing atmosphere. It’s where you can sit down for a pleasant lunch or dinner in one of the dining rooms or watch your favorite game at a spacious bar. MJ’s uses only the finest ingredients for all of their appetizers, entrees, sandwiches, salads and pizza. Their pizza is the best in the area; thin or traditional crust! Mouth-watering chef’s choices and drink specials are featured daily, along with live entertainment 4-5 nights a week. MJ’s happy hour is the best in the area, every Monday – Friday at the bar. Other MJ’s Restaurant are located at: Route 537 and Sycamore Avenue in Tinton Falls, New Jersey, Highway 35 in Middletown, New Jersey, Highway 66, Neptune, New Jersey, Highway 34 in Matawan, New Jersey and Summerhill Road in Spotswood, New Jersey. All of the MJ’s restaurants have been well-received and are extremely popular. Already looking ahead toward #7, MJ’s is actively pursuing new locations. All site selection is managed by Bielat Santore & Company, Allenhurst, New Jersey.